It is said about Trimbakeshwar temple that once other brahamin’s wife’s got annoyed with Maharshi Gautam’s wife. So all other brahamin’s ganged up and worshiped ganesh ji. Ganesh ji became happy with there effort and gave them a wish that he’ll fulfil. On this all the Brahamin’s asked ganesh ji to make Maharshi Gautam and his wife leave the ashram any how. Ganesh ji didn’t like this wish and tried to explain everyone that it will be wrong but Brahamin’s were not ready to understand. So unwillingly Ganesh ji took the form of a weak cow and started feeding Maharishi Gautam’s farm. Seeing the cow spoiling the crop, Maharishi Gautam tried to take a cow out of the field, but as soon as Maharshi Gautam touched the cow it died. Seeing that all the Brahmins got distracted and forced Maharishi Gautam to leave the ashram with his wife. At the same time, the terms of condition for the atonement of killing cow were kept. Maharishi Gautam still did all the work that he was asked by the Brahamin’s and after that he got involved in worship of Shiva. Shiv ji became happy and appeared in front of him and asked Maharishi Gautam to ask for a wish. Maharishi Gautam asked Shivji to relive him for atonement of sin of murder of the cow. On this Shivji told him that you have been deceived and I will punish those Brahmins who has done this. But Maharishi Gautam said to Shiva that because of the action by Brahamin’s he was able to meet Shiva and he’s thankful to them for it. Maharishi Gauta said dear god if you want to give me something then stay here with me. 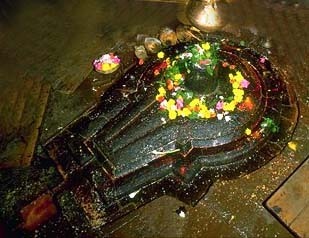 Shiva ji stayed there after listening to him, and the place is called Trimbak Jyotirling. Gangaji brought by Gautamaji also started flowing in there by the name of Godavari. The rebuilding of the Trimbakeshwar temple was started by the third Peshwa Balaji ie Nana Sahab Peshwa. For the long period of 31 years, the work of renovation of the temple was done from 1755 to 1786 and about 16 lakh rupees was spent.